The letters of 1 and 2 Timothy and Titus have been grouped together and referred to as the “Pastoral Epistles” because they are addressed to individuals charged with the oversight of certain churches and, therefore, share common subject matter. These letters give us an intriguing glimpse into events in the life of the Apostle Paul and the early church that is found nowhere else in the New Testament. As such, they offer the possibility of increasing our knowledge of the history of Paul’s life and ministry and the early history of Christianity in general. W. Hulitt Gloer is David E. Garland Professor of Preaching and Scriptures and Director of the Kyle Lake Center for Effective Preaching at Baylor University’s George W. Truett Theological Seminary. He is the author of As You Go: An Honest Look at Jesus’ First Disciples and Reading Paul’s Letters to Individuals: A Literary and Theological Commentary on Paul’s Letters to Philemon, Titus, and Timothy (with Perry L. Stepp). 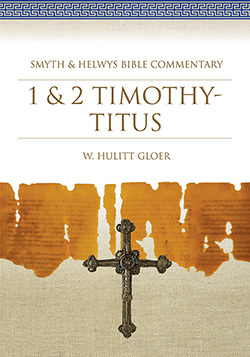 Hulitt Gloer has written a very helpful and informative commentary on the Pastoral Epistles that addresses the major issues at stake in these often controversial letters, and he interprets them with their original readers in mind. He recognizes the many difficult critical issues involved in their study, but more importantly he takes these three letters seriously as canonical Scripture and reads them in this light. Through the volume there are cogent sidebars with useful information, and the Connections sections help the reader—whether lay person or pastor—to recognize important practical insights.